Whether buying a new home or renovating your current one, these days a butler’s pantry seems to be high on most people’s wish lists. It’s no longer a luxurious addition only for the rich and famous, it has now become a popular requirement for most home-owners and it looks like this trend is here to stay. Obviously, there needs to be the relevant space available to incorporate this into your design layout but if you can do so, it will be well worth it in the end. So, what actually is a butler’s pantry? Essentially, a butler’s pantry is a second kitchen hidden away within the main kitchen. Its purpose is to allow you to prepare food and clean up after meals without making a mess of the main kitchen where everyone can see. A butler’s pantry is functional as well as luxurious. It provides extra storage and work space and gives a discrete home for your appliances and any items which are not used regularly. You have that extra space and everything you need easily on hand but is all just out of view. But before you dive right in and finalise your plans, make sure your ‘pantry planning’ has included some essential details and considerations to ensure you get the best use of your space. It’s important to look at how you use your kitchen on a daily basis and when entertaining. Electrical points and plumbing need to be thought about early on. A butler’s pantry doesn’t have to be big to be practical and stylish. A measurement of 1600mm is a suitable size for a straight walk-in pantry. This will provide enough room for a benchtop with a depth of 600mm and 1000mm wide for floor space/access. 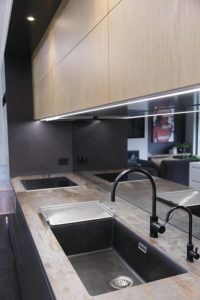 Cabinetry below the benchtop and above the benchtop with depth of 300mm will provide plenty of storage space. However, if these measurements are too big for the space that you have available then benchtop depths can drop back to 500mm or even 400mm. These will still provide sufficient space for prepping food and placing dirty dishes on them. If you are opting for a galley or u-shaped pantry then measurements should be 2400mm and upwards, depending on space available etc. A large reason for wanting a butler’s pantry in the first place is to keep your main kitchen clutter free. 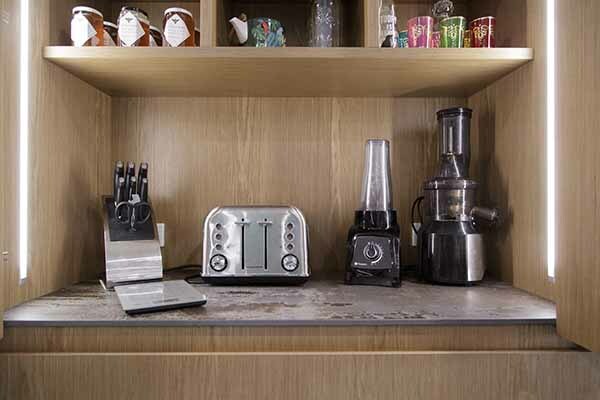 So apart from items such as crockery, glassware and dry foods you should keep your small appliances like toasters, microwaves, thermomix, slow cookers etc plugged in on the bench top in the butler’s pantry. This will keep your main kitchen neat and tidy but you will still have the benefits of having everything you need on hand with quick and easy access. For this reason, ensure that you have considered a good amount of power points to be installed. The butler’s pantry is also a good home for a dishwasher and an additional sink to your main kitchen sink. That way, when entertaining you can put all you dirty dishes straight out of sight and deal with them later when your guests have gone home. Plumbing will obviously be required, but also consider your sink size. Opt for the biggest size possible for your bench space (so it can handle dirty pots and pans). Stainless steel laundry sinks can be a good option to think about? Maximise space by considering running your shelves and cabinetry to the ceiling. Items used infrequently can be placed in the top storage (to be safely accessed using a step ladder) while items used more regularly can be at an easily accessible height. Open fronted shelves and cabinetry can be a great option for storing items that you want to easily find and access quickly. You don’t need to spend as much money in here as you do in your main kitchen, save on dollars by choosing laminate benches instead of stone and select shelving as opposed to drawers. These choices will keep your spending down but will still look great. Be mindful of treating your butler’s pantry as a continuation of your main kitchen so colours and styles will need to reflect and be unified with your main kitchen choices. If you’re lucky enough to have a window in your butler’s pantry then you are winning with natural light flooding in. If, however, there is no window then be sure to incorporate some form of good lighting. You don’t want to be prepping food or cleaning dirty dishes in a poorly lit space. Down-lights are a fantastic option as they will provide great light as well as keep the pantry feeling open and airy. An added skylight is also an option if it is viable. No matter what amount of space you have, just be sure to make the most of it. If you are unsure of how to do this then hiring an interior designer will get the best result. So there we have it, our tips for creating a fabulous butler’s pantry – Enjoy!